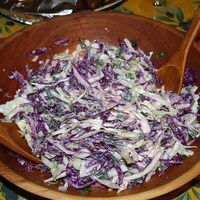 Thinly slice cabbage, using a mandoline or food processor if desired--the thinner the better!. Slice green onions, and wash, dry and chop cilantro. (I threw in extra Cilantro for good measure!) Combine cabbage, green onions and cilantro in large salad bowl. I made a little extra dressing and reserved 1/3 cup to add after refrigerating, right before serving. This recipe has moved to the top of my favorite coleslaw recipe list. I love the simple ingredients that combine for great flavors. I substituted Nappa cabbage, as that was the only green cabbage I had on hand, but everything else I left the same. I will make this again and again! Hey there, John! I followed your recipe exactly, then made the following modifications to the dressing. I added one small jalapeno, seeded and very finely minced; added 1 tsp cumin seeds, toasted in a cast iron skillet; added 1/4 tsp ground cumin; 1 tsp original Pickapeppa Sauce, and 1/2 tsp original Tabasco Sauce. I made a nest of the slaw and filled the center with hearty scoops of Curried Chicken Salad. Guests loved the dish, and I heartily thank you for the inspiration! These changes sound yummy, Amos. The cumin and curry must have really picked up the flavor. I'll have to try that next time. John this looks awesome as written, and I love Amos's modifications too! I need to print this off, as I've found myself working in a logging camp for the winter, but have no internet access...it's a very remote camp. I have a HUGE binder that I have to lug back and forth with me, and this is going to be the first recipe I make when I get back to work. Who knows? Maybe I'll come up with some other ideas for it. It seems to be a very versatile recipe. Hope you enjoy it A.L.! So glad you enjoyed it Sue. Thanks for the thoughtful review! I had this signature coleslaw at Hackneys Restaurant at Printers Row. This is the worst coleslaw I have ever eaten at a restaurant. I am a KFC fan!! Stick to everything else on the menu which is delicious. Beverly Arnold South Bend, IN. I was looking for a slaw to serve with fish tacos this weekend and this is what I was looking for!!!! I may use a little cumin in place of hot sauce not sure yet. I will make it according to your recipe first, looks great! This is a different twist of coleslaw that we always make at home. Could try this one. I love the use of red cabbage in this dish. Makes it more appealing to kids, too! I'm not a big fan of cilantro, but it definitely lends that Mexican flavor! EZ Snapper with Lime & Cilantro Sauce. Dinner to the table in 20 min.